It is nice to see that side of things. What\'s up with his ear though? Looks like it might be a bit frostbitten. The crisp image of the borderguard is very poignant against the perfectly blurred background of the vehicle. Great photo! Nice shot man, the capture of that boredrom momment is quiet good. wow -not only were you able to capture the guards momentary lapse – but you did it sharply too. A well deserved Noteworthy. best shooting from the hip pix yet! excellent composition … luck and guts .. good combo! The story behind "Chinese borderguard at Tibetan border"
The border between Tibet & Nepal is called the Friendship Bridge, connecting the 2 sides of the roaring river. 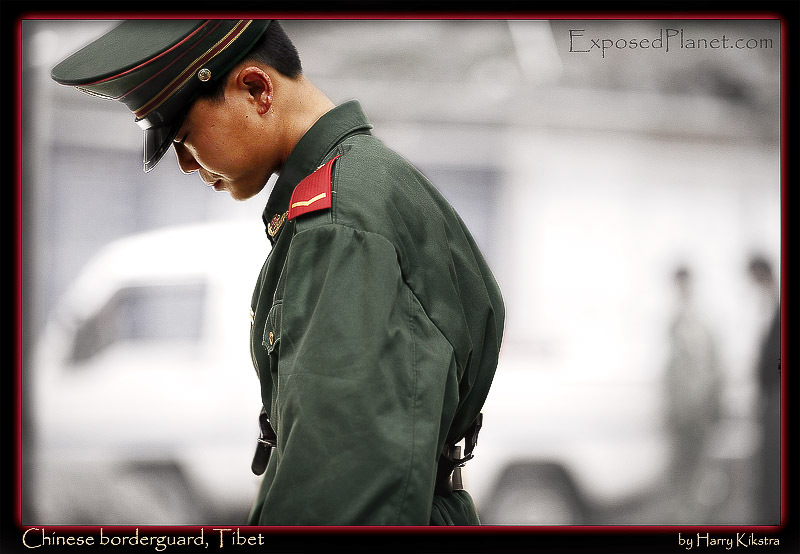 Nowadays Tibet is Chinese, a situation that will not be resolved soon. The Chinese are different from the Nepali and you can tell this at the border. The Nepali side is chaotic and friendly, the moment you cross the bridge everything is still chaotic, but it is organised and regulated. Last year we were not allowed to take any pictures here but now the border guards seemed to relax a bit. Though it was very crowded when we passed on our way to Mt Everest and we could take images of ourselves, it was not allowed to take a picture of the guards or anything official. Suddenly I saw this borderguard letting go of the usual power-stance, instead of staring straight ahead without any sign of life or feelings, he let his head down for a moment and turned away from observing us. I was surrounded by dozens of Sherpas and other climbers and tourists, but managed to shoot one single quick shot from the hip with my 135mm fixed that was still on the body. Only that evening I saw it and it was immediately one of my favourites. In my view it shows that everybody is human, how terrible your job may be. Maybe he was just tired from watching silly western tourists entering this dry and high country, maybe he was thinking about the Tibetan population or about his children back in Beijing, who will tell. Voted ‘Noteworthy’ on PhotoFriday’s Alone challenge, thanks!